Shaun Nua (born May 22, 1981) is a former American football defensive end. He was drafted by the Pittsburgh Steelers in the seventh round of the 2005 NFL Draft. He played college football at Brigham Young University. 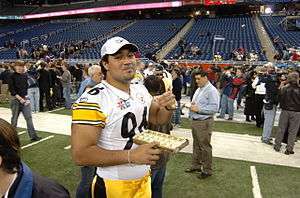 Nua earned a Super Bowl ring with the Steelers in Super Bowl XL against the Seattle Seahawks. He has also been a member of the Buffalo Bills. Shaun Nua attended Tafuna High School in Tafuna, American Samoa. As a senior, he won All-League honors as a defensive end. Nua attended Brigham Young University. Starting the 2002 and 2004 seasons, he red shirted in the 2003 season. Shaun Nua attended Eastern Arizona Junior College in Thatcher, Arizona from 2000 to 2002. Following his stint in the NFL, Nua returned to his alma mater, BYU, as a defensive graduate assistant from 2009-2011. Nua helped the Cougars achieve the nation's 24th-best total defense in 2010 and the 13th-ranked defense in 2011. BYU won its bowl games both years while finishing the 2011 season ranked No. 25 in the final USA Today Coaches Poll with a 10-3 record. On January 26, 2012 Nua joined the football staff at Navy as an assistant coach with the defensive line. In 2012 the Midshipmen finished with an 8-5 record and an appearance in the Kraft Fight Hunger Bowl, where they suffered a 62-28 loss to Arizona State. Nua is a native of Pago Pago, American Samoa. He transferred to BYU from Eastern Arizona Junior College, where he earned junior college All-America honors. He prepped at Tafuna High School in Tafuna, American Samoa where he was an all-league performer as a defensive end. Nua is a cousin to BYU's former assistant softball coach, Ianeta Le'i and BYU All-American volleyball player Futi Tavana.